Here is a tool that has been around for ages and has been a staple for anyone using audio. Many podcasters, video editors and voiceovers have started with this free tool and many still prefer it over paid tools. 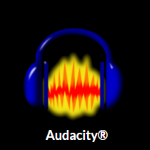 If you are doing voiceovers for your videos and don’t currently have an audio editing tool, then you need Audacity! There is a slight learning curve, but you will be more than pleased with the results and the time you spend learning turning out higher quality audio will be well spent! This is a Free tool and is for Windows and Mac. Balance volume and sooooo much more. If you are just getting started with editing and recording audio, you can find a load of tutorials on YouTube that will show you how to use Audacity. Even though many free tools are made and then left to die after a short time, Audacity has continued to make updates and upgrades. Go check it out and don’t be intimidated to try it, you can learn to do basics and even the basics will improve your audio in many cases.